Looking for an exclusively designed pickups and drops facility to your preferred destination? If yes, then our transfer service is just for you. You can avail this service for airport pickups and drops, hotels pickups and drops, railway station pickups and drops, and bus stand pickups and drops. Our trained chauffeur will reach the appointed destination in time dressed in uniform. For outstation travel purposes, we have specialised packages designed for our clients. These are a perfect way to spend time with friends and loved ones outside the city limits. The package is arranged as per the interests and requirements of our clients. We also arrange for group packages from Kanyakumari to places nearby. Looking for only to and fro service? This package is offered in Kanyakumari to multiple destinations. This is a one way service to ensure comfortable one way drop to preferred destinations from Kanyakumari. For travel to multiple cities within a fixed period of time, we offer a specially designed multi city travel hire service. If you wish to enjoy a unique travel experience to Kanyakumari which includes facilities you fantasise and comes under your budget, we can customize one for you. Our team will design a special package from scratch to suit your travel needs. We also offer special Kanyakumari city sightseeing tours and any other customized cab rental packages. 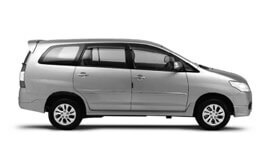 At My Taxi India, we guarantee the best car rental services in Kanyakumari at highly affordable prices. Kanyakumari enjoys a moderate climate throughout the year. Summers extend from March to May. The climate is pleasant with occassional sea breeze blowing. The weather is also mildly warm during the day which makes it perfect for beach activities. Winters extend from December to February. These months are very pleasant and perfect for tourist activities. The place experiences Monsoons between June and September months with medium to heavy rain falls and thunderstorms. As per the 2011 census, Kanyakumari district had a population of 1,870,374. Tourism and fishing contributes to economy for Kanyakumari. Kanyakumari is a beautiful town in Kanyakumari District in the state of Tamil Nadu in India. Earlier, the place was renowned as ‘Cape Comorin’. Exquisitely surrounded by Majestic Hills and the plains, enclosed by colourful pristine sea-shores, elegantly dancing coconut trees and lush paddy fields, Kanyakumaris is a world famous tourist site. Some of the must visit places in Kanyakumari include Kumari Amman Temple, Gandhi Memorial, Vivekananda Rock Memorial, Suchindram temple, Alvar Tirunagari temple, Baywatch Kanyakumari, Kanyakumari Beach, Kuttralam, Mundathurai Tiger Sanctuary, Muttam, Mathoor Hanging Bridge, Nagaraja Temple, Suchindram Temple, Padamanabhapuram, Pechiparai Dam, Thiruvalluvar Statue, Thengapattinam Beach, Thirparappu Waterfall, Tirunelveli, Udayagiri Fort, Vattakottai, and many more.